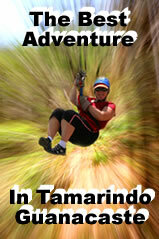 The best Canopy tour in Guanacaste, enjoy the adventure with Us!! On the outskirts of Tamarindo, situated on a private reserve, The New Monkey Jungle is located in a tropical dry forest, with all the species and characteristics of the conservation area of Tempisque in Guanacaste. In this special place our 7 cables take off from the mountain side into the tree tops where under the canopy you can observe the animals that call this forest their home: Congo Monkeys, White Face Monkeys, Lizards, Armadillos, Wild boars and with luck small deer along with a large variety of native trees and plant species. When you and your family enjoy the beautiful beaches of Tamarindo in Guanacaste do not forget to be part of a great family adventure on our Canopy tour where you will enjoy beautiful landscapes with great variety of animals in their natural habitat. You can also combine our Canopy with an incredible adventure in Honda TRX 250 ATVs through beautiful trails to reach beautiful beaches like Bahia de los Piratas world famous. Come and enjoy the beauties of Costa Rica with us, we await you. Let us be part of the fun! Because beach and adventure are the best combination.